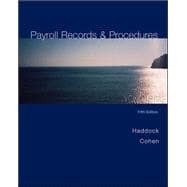 Payroll Records and Procedures, 5e, by Haddock/Cohen consists of a student text-workbook, and practice set. The program presents payroll activities and related materials as a single unit and includes a comprehensive practice set that is available separately or shrink-wrapped with the text-workbook. The easy-to-read presentation of topics helps students develop efficient working procedures. Numerous illustrations and examples using federal and state forms support content.